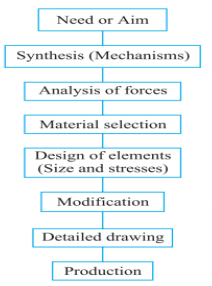 i) What are the factors to be considered for selection of materials for design of machine elements? Factors to be considered for selection of material for design of machine elements a) Availability: Material should be available easily in the market. b) Cost: the material should be available at cheaper rate. c) Manufacturing Consideration: the manufacturing play a vital role in selection of material and the material should suitable for required manufacturing process. d) Physical properties: like colour, density etc. f) Mechanical properties: such as strength, ductility, Malleability etc. g) Corrosion resistance: it should be corrosion resistant. (i) FeE220: Steel having yield strength of 220 N/mm2 . (ii) 20C8 : Carbon steel containing 0.15 to 0.25 percent (0.2 percent on average) carbon and 0.60 to 0.90 percent (0.80 percent on average) manganese. Ergonomics is defined as the scientific study of the man – machine working environment relationship and the application of anatomical, physiological, psychological principles to solve the problems arising from this relationship.  However, for brittle materials which are relatively strong in shear but weak in tension and compression, this theory is generally used.  This theory is also known as maximum principal stress theory or Rankine’s theory. 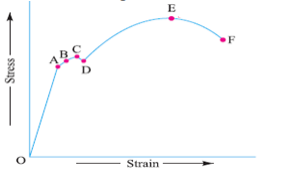 Maximum Shear Stress Theory  According to this theory, the failure or yielding occurs at a point in a member when the maximum shear stress reaches a value equal to the shear stress at yield point in a simple tension test. 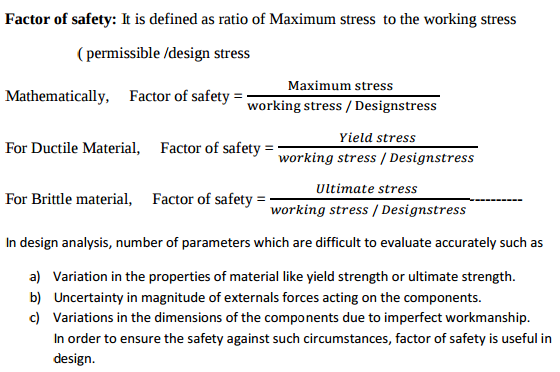 Mathematically, τmax = τyt / F. S. where, τmax = Maximum shear stress τyt = Shear stress at yield point as determined from simple tension test F. S = Factor of safety  Since the shear stress at yield point in a simple tension test is equal to one half the yield stress in tension, therefore τmax = σyt / (2 x F. S.)  This theory is mostly used for designing members of ductile materials.  This theory is also known as Guest’s theory or Tresca’s theory. as: lighting, noise, temperature, humidity, air circulation, etc. Working Environment  The working environment affects significantly the man-machine relationship.  It affects the efficiency and possibly the health of the operator.  The major working environmental factors are: Lighting, Noise, Temperature, Humidity and air circulation. Ergonomics Considerations in Design of Controls  The control devices should be logically positioned and easily accessible.  The control operation should involve minimum and smooth moments.  The control operation should consume minimum energy.  The controls should be painted in proper colour to attract the attention. Ergonomics Considerations in the Design of Displays  The scale should be clear and legible.  The size of the numbers or letters on the scale should be taken appropriate.  The pointer should have a knife-edge with a mirror in a dial to minimize the parallax error while taking the readings.  The scale should be divided in a linear progression such as 0 – 10 – 20 – 30… and not as 0 – 5 – 25 – 45…..  The number of subdivisions between the numbered divisions should be as less as possible.  The numbering should be in clockwise direction on a circular scale, from left to right on a horizontal scale and from bottom to top on a vertical scale. Explain with neat sketches only (i) Methods of reducing stress concentration in cylindrical members with shoulders. 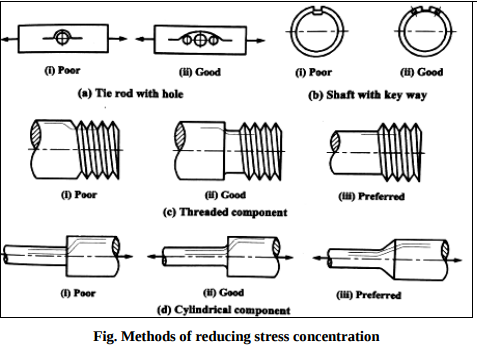 (ii) Methods of reducing stress concentration in cylindrical members with holes. Stress concentration: Whenever a machine component changes the shape of its cross section, the simple stress distribution no longer holds good and the neighbourhood of the discontinuity is different. This irregularity in the stress distribution caused by abrupt changes of form is called ‘stress concentration’. i. Stress Concentration: Whenever a machine component changes the shape of its cross-section, the simple stress distribution no longer holds good and the neighborhood of the discontinuity is different. This irregularity in the stress distribution caused by abrupt changes of form is called stress concentration. It occurs for all kinds of stresses in the presence of fillets, notches, holes, keyways, splines, surface roughness or scratches etc. Proportional limit (A): The stress is proportional to strain. Beyond point A, the curve slightly deviates from the straight line. It is thus obvious, that Hooke's law holds good up to point A and it is known as Proportional limit. Elastic limit (B): If the load is increase between point A and B, the body will regain its original shape when load is removed; it means body possesses elasticity up to point B, known as Elastic Limit. Upper yield point (C): If the material is stressed beyond point B, the plastic stage will reach and the material will start yielding known as Upper Yield Point. Lower yield point (D): Further addition of small load drops the stress-strain diagram to point D, as soon as the yielding start, this point ‘D’ is known as Lower yield point. Ultimate stress point (E): After the end of yielding, if the load is increase beyond point ‘D’, there is increase in stresses up to point E and thus maximum value of stresses at point ‘E’ is called as Ultimate Stress point. Breaking Stress point (F): After the specimen has reached the ultimate stress, a neck is formed, which decreases the cross-sectional area of the specimen. The stress corresponding to point F is known as Breaking stress. a. Reliability of applied load. b. The extent of simplifying assumptions. c. The certainty as to exact mode of failure. d. Reliability of properties of material and change in these properties during service. e. Extent of stress concentration. f. The reliability of test results to actual machine parts. g. The extent of initial stresses set up during manufacturing. h. The extent of loss of life, if failure occurs. 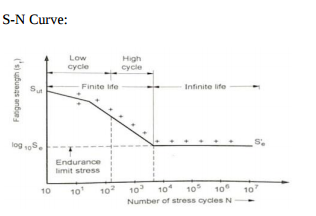 Endurance Limit: It is defined as maximum value of the completely reversed bending stress which a polished standard specimen can withstand without failure, for infinite number of cycles (usually 107 cycles).It is known as endurance or fatigue limit (ϭe). 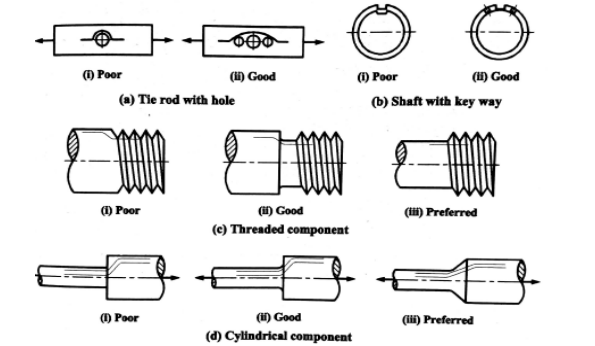 In most machine elements have some forms of discontinuity, namely sudden change in cross section, grooves ,holes, keyways and other changes in sections. these continuity in machine element alter the stress distribution in the neighborhood so that the elementary stress equations no longer described the actual state of stress in the part, such discontinuity is called stress raisers and in the region in which these occur is called the area of stress concentration. Internal cracks and flaws, cavities in welds, blowholes, and pressure in certain points are the common examples of stress raisers. Ergonomics consideration in the design of Lathe machine Any 4 1) The controls on lathe should be easily accessible and properly positioned. 2) the control operation should involve minimum motions. 3) Height of lathe should be match with worker for operation 4)Lathe machine should make less noise during operation. 5) force& power capacity required in turning the wheel as per operation or human being can apply normally. 6) should get required accuracy in operation. Stress Concentration: Whenever a machine component changes the shape of its cross-section, the simple stress distribution no longer holds good and the neighborhood of the discontinuity is different. This irregularity in the stress distribution caused by abrupt changes of form is called stress concentration. It occurs for all kinds of stresses in the presence of fillets, notches, holes, keyways, splines, surface roughness or scratches etc. Causes of stress concentration are as under. 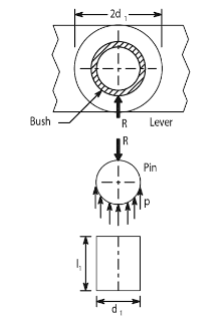 i) Abrupt changes in cross-section like in keyway, steps, grooves, threaded holes results in stress concentration. 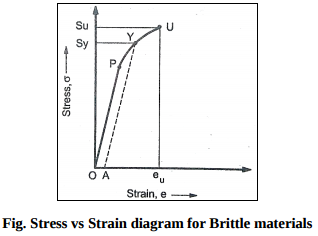 ii) Poor surface finish – The surface irregularities is also one of the reason for stress concentration. iii) Localized loading – Due to heavy load on small area the stress concentration occurs in the vicinity of loaded area. iv)Variation in material properties – Particularly defects like internal flaws, voids, cracks, air holes, cavities also results in stress concentration. 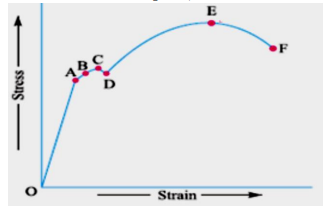 Point A: Proportional limit Point B: Elastic limit Point c: Upper yield point Point D: Lower yield point Point E: Ultimate tensile stress point Point F: Breaking Stress point. 1. Proportional limit. We see from the diagram that from point O to A is a straight line, which represents that the stress is proportional to strain. Beyond point A, the curve slightly deviates from the straight line. It is thus obvious, that Hooke's law holds good up to point A and it is known as proportional limit. 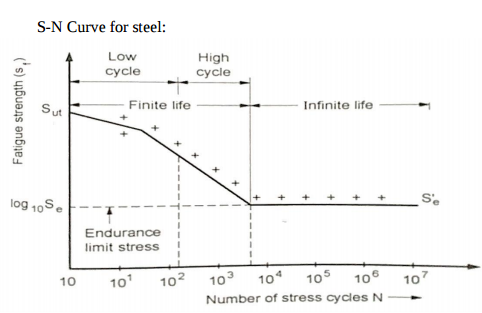 It is defined as that stress at which the stress-strain curve begins to deviate from the straight line. 2. Elastic limit. It may be noted that even if the load is increased beyond point A upto the point B, the material will regain its shape and size when the load is removed. This means that the material has elastic properties up to the point B. This point is known as elastic limit. It is defined as the stress developed in the material without any permanent set. 3. Yield point. If the material is stressed beyond point B, the plastic stage will reach i.e. on the the load, the material will not be able to recover its original size and shape. A little consideration will show that beyond point B, the strain increases at a faster rate with any increase in the stress until the point C is reached. At this point, the material yields before the load and there is an appreciable strain without any increase in stress. In case of mild steel, it will be seen that a small load drops to D, immediately after yielding commences. Hence there are two yield points C and D. The points C and D are called the upper and lower yield points respectively. The stress corresponding to yield point is known as yield point stress. 4. Ultimate stress. At D, the specimen regains some strength and higher values of stresses are required for higher strains, than those between A and D. The stress (or load) goes on increasing till the point E is reached. The gradual increase in the strain (or length) of the specimen is followed with the uniform reduction of its cross-sectional area. The work done, during stretching the specimen, is transformed largely into heat and the specimen becomes hot. At E, the stress, which attains its maximum value is known as ultimate stress. Itis defined as the largest stress obtained by dividing the largest value of the load reached in a test to the original cross-sectional area of the test piece. 5. Breaking stress. After the specimen has reached the ultimate stress, a neck is formed, which decreases the cross-sectional area ofthe specimen, as shown in Fig. The stress is, therefore, reduced until the the specimen breaks away at point F. The stress corresponding to point F is known as breaking stress. i) Fe E 230 : Steel with min.Yield strength of 230N/mm2 ii ) X20Cr 18 Ni 2:Specification: It is ALLOY STEEL having Carbon 0.20% ,Chromium 18% and Nickel 2% iii )35 C 8 : steel with 0.35% carbon & 0.8% Manganese. iv) 40 Ni 2 Cr 1 Mo 20 :Alloy Steel having 0.4% carbon,0.5% Nickel, 0.25% chromium,2.8% Molybdenum.